Our moods ebb and flow with the seasons. They also change quite dramatically over the course of a single week. 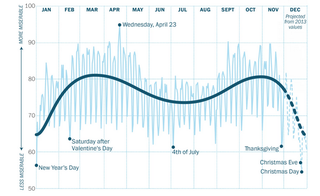 These visualizations show exactly when we can expect to be depressed, anxious, and stressed. These visualizations were put together by Christopher Ingraham of the Washington Post, and he calls them the index of misery. Using Google Trends, he aggregated five terms — depression, anxiety, pain, stress, and fatigue — to compile the two matrices, one showing our misery over the course of a calendar year, the other showing the weekly cycle of despair. Ingraham interpreted higher search volumes for each of the five terms as a sign of their prevalence. The searches rise in the spring and fall, ebb during the summer months, and drop sharply during holidays. Christmas is the least miserable day of the year, with Christmas Eve and New Year's Day not far behind (numbers for December of this year are projections based on last year's figures). A seemingly random Wednesday in late April may be the worst day of the year. Over the course of a week, our moods appear to get better. Saturday is clearly the best day of the week — and we literally hurt more on Mondays. And interestingly, "depression" and "stress" showed the most day-to-day variation among the terms. Be sure to check out the entire article at The Washington Post.